California Gov. Jerry Brown Jr. issued two emergency proclamations for San Diego County Monday following brutal winter storms that have battered the region. The proclamations were issued to secure funding to help communities respond to, and recover from, the severe winter storms that have caused flooding, mudslides, erosion, debris flow and damage to roads and highways. With the proclamations, Brown has directed Caltrans to formally request immediate assistance through the Federal Highway Administration’s Emergency Relief Program, and he has requested the Office of Emergency Services to provide assistance to local governments. In addition to San Diego, 48 of California’s 56 other counties fell under the governor’s state of emergency, including Los Angeles, Orange, San Bernardino, Ventura and Santa Barbara. 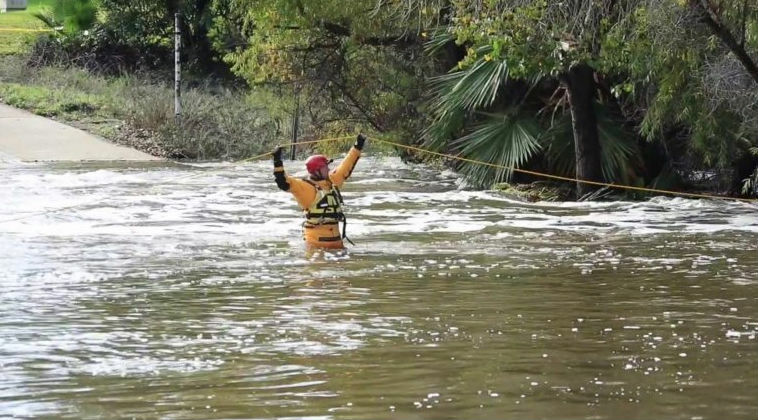 Brown’s proclamations come as the final installment in a back-to-back series of strong winter storms unleashed still more rain and mountain snow Monday on the already saturated San Diego area. With the days of rain, the deluge forced flooding- and debris- related closures of various streets, including stretches of Avenida del Rio, Camino de la Reina and Fashion Valley Road in Mission Valley; Carroll Canyon Road in Sorrento Valley; Hunter Street in Ramona; La Media Road in Otay Mesa; Niagara Avenue in Ocean Beach; San Diego Mission Road in Grantville; and Saturn Boulevard in Palm City. The cloudbursts set one rainfall record for the date — in Campo, where 2.72 inches fell, exceeding the prior Jan. 23 milestone of 1.18 inches, set in 1967, meteorologists reported. Over the 24-hour period ending at 5 p.m., according to the National Weather Service, the dark bands of clouds dropped 3.68 inches of moisture in Julian and at Lake Cuyamaca; 3.6 in Pine Hills; 3.58 at Palomar Observatory; 3.45 at Henshaw Dam; 3.29 in Descanso; 3.24 on Birch Hill; 3.02 at Mount Woodson; 2.85 in Oak Grove; 2.84 in Mesa Grande; 2.69 on Volcan Mountain; 2.63 on Mount Laguna; 2.51 in Pine Valley; 2.41 in Santa Ysabel; 2.16 in Skyline Ranch; 2.09 in Echo Dell; and 2.08 in Warner Springs. A winter storm warning for the mountains was set to expire in the early evening, though intermittent snow showers likely will continue tonight and into Tuesday. A flash-flood watch for the entire county prompted by brief but heavy rainfall and isolated thunderstorms will also expire tonight, as will a wind advisory for the deserts. A high-surf warning prompted by waves of 5 to 10 feet and sets to 13 feet south of Carlsbad will remain in effect until 10 p.m. Tuesday. The showers are expected to gradually decrease overnight and Tuesday, and increasing high pressure will bring drier, warmer weather beginning Wednesday and continuing through the weekend, according to meteorologists.